This article was submitted by Online-Basketball-Drills.com. Get free basketball drills, plays, and coaching tips at Online-Basketball-Drills.com. Over 724 unique, fun and effective practice ideas your players will love. A great offense in basketball is a lot like a great quarterback in football - they have the ability to check down to their second and third reads if the primary option isn't there, remaining calm, cool, and collected in the face of a high pressure defense. All too often in practice, because we as coaches want to show our players the play in it's entirety, we gloss over the first, second, and third options, finishing the play with a shot for our last option. This conditions our players to do the same in games - if they don't hit their player on an early backdoor cut in practice, why would they do it in a game? To combat this, I try to make my point guards look at each play the same way a quarterback would, thinking of players as primary, secondary, and tertiary targets. The simplest way I found to do this, is to show players the play you want to teach them, but to only show them the primary option until they learn it. Once they've got it down, we'll revisit the play, and add a foil, or a counter to that same play. This way players learn the progression more organically, and it becomes second nature for them to 'check-down' to their next option the same way a quarterback would. Here we've got a fairly simple play, with a 4 out, 1 in set. The point will dribble left, with the 4 man heading down to set a stagger screen for the shooting guard coming across to the ball side, as the small forward makes a shallow cut to the opposite wing. If the big men both set solid screens, the shooting guard should have a good look at a three point shot, or be able to slash into the lane to get to the hoop and find one of his bigs for a layup. Once we've run this through a couple of times, letting both big men get used to both positions and the same with the wings, we'll add in the next foil. If the shooting guard does get open a couple of times off the stagger, the defense will compensate by having the big men slide over and hedge or even switch men. To take advantage of this, here we make the pass to the wing coming across the lane high, hitting him as he reaches the right wing. As this pass is made, the center will seal his man down low, and the power forward will pop up to the free throw line. If they switched on the screens, we'll have a mismatch with one of our big men, and if they're hedging they'll be out of position, and some quick decision making in the high low will usually result in an easy basket. It's on the point guard to make this read - he needs to watch what the defenders are doing in the paint and pass the ball to the man in the best situation, just like we watch Tom Brady do any given Sunday. 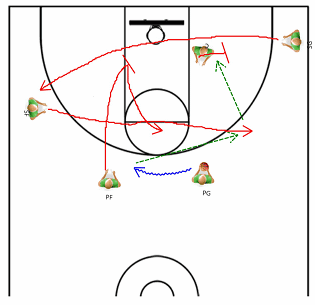 If you're looking for more plays to add to your arsenal, check out our entire archive of basketball plays, featuring everything from the triangle offense to the classic motion. Good luck!